So we were sitting out back the other day, on a break, and suddenly I said, “When the heck did that tree fall?” Answer: in between when we started the roof and that very moment. Ugh. This large old birch tree fell in the most precarious way, such that any attempt to cut it out of the tree it was hung in, or cut it at the base, would make it cut loose and slam into the house or down onto the (new) roof. Double ugh. After pondering for a while, we decided to call in an expert, who arrived on Thursday around 3:00 pm and had the tree down and on the ground in small pieces by about 4:00 pm. Back to roofing. Between yesterday and today, we got all of the large metal sheets on. Now we just have lots of trim and finishing pieces to go. And one more week till we are back to work full time…can we make it in time??? Friday: finished across the top of the trnsition. Friday: other side, top pieces done. Front porch, last pieces of metal. 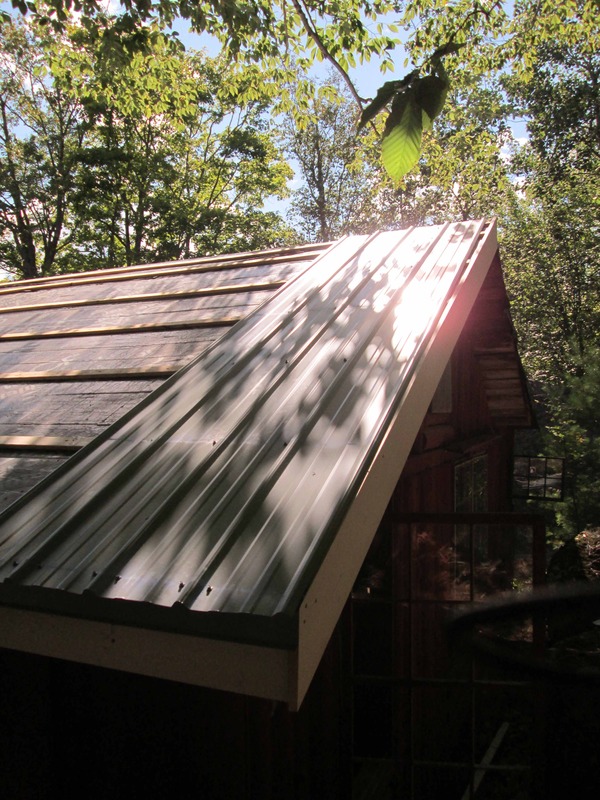 Fantastic day for a hike…oh, and some roofing too. We ran out of parts. Well, actually, someone-who-placed-the-order-at-the-big-orange-store-we-are-already-not-happy-with switched a letter in the part order and we got a giant gable end instead of some slope transition pieces. Tomorrow we re-order. Until then, today became a day for doing everything else we can possibly do on the roof without those key parts. So we did a lot of really fun stuff – in fact, we finally had a day that we did everything on our list and didn’t have any glitches. We even snuck in a hike before lunch, and found a great old trail right behind our property. We ended the day by cleaning – inside and out – so that the work area is much easier to navigate. Oh, and we folded up all the tarps. The house finally looks somewhat respectable again. Two of the last four fascia boards – right out front! Parts of the trail were well-maintained. All of it was gorgeous. Found our nearest USGS benchmark. 89 feet above sea level! The lake is in a deep valley, and this is close to the shore. Yesterday we put in new cedar shake to repair what we had to remove to do flashing. From at least one angle, it looks pretty much done. A few trim screws to go here. Fascia, metal, and even gable end on some parts of the back. This used to be the most awful-looking, swayback roof on the house. A good bit straighter now. And finally, we cleaned up the very cramped work area. There’s almost no flat ground at this house, which makes it really hard to work with huge sheets of metal. This total reorganization gets us set for round three. So now we have 3-1/2 days off while we wait for the big flat transition flashing. This is OK – I have a work trip and we can both use a break. Fortunately the weather is supposed to stay just how it’s been – clear, warm, and most importantly, dry. At the end of this week: we roof! And we finish! This was a funky week. After keeping the whole week as open as possible (given occasional emergencies at work), and a stellar weather forecast at the beginning of the week, it managed to rain on the first full day we planned to lay more roofing. It was one of those irritating days where you think the rain stops, then get back to work, then it starts again. Repeat 3-4 times, then throw up your arms and do something else. So we went inside and worked on supporting and sistering various rafters. One section needed a support toward the outside wall; we decided to use a log salvaged from the cellar (our first log work), split it, and place it as a ledger to carry the rafters, rather than replace a complicated notched beam. 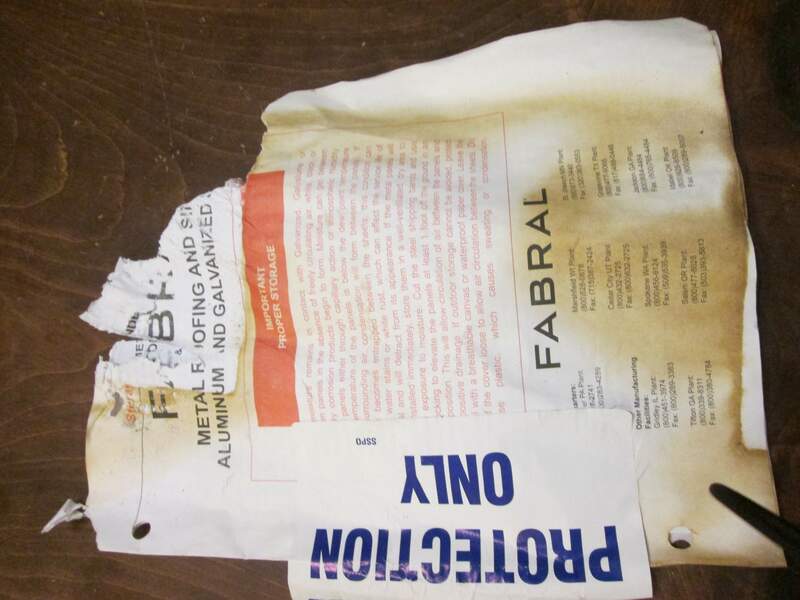 And then our skilsaw burned up – fortunately just as we pretty much finished slabbing the log. Had to finish with my little old block plane, old school style. Not sure Roy Underhill would be proud, but we got it done. But then we had two glorious weather days and really got cooking. We have two more days open…let’s see what we can do by the end of Sunday. End wall of the ‘study’, with temporary support. The log that broke the skilsaw (not skilsaw brand – it was a Ryobi. Next saw: DeWalt or Porter Cable, for sure). Our new ladder! A 24′ extension ladder we bought from a local contractor going out of the biz. A gorgeous fireman’s ladder we got for about 1/3 of the new price. ‘Helper’ finds the roofing a bit tedious. Pile o’ metal. 34 sheets, to be exact. Two sections are done, approximately half the total area. The biggest single section of roof is officially done! Saturday was the pits. We went to pick up our roofing from a Big Box (where we won’t be shopping again, thank you), and after calling to confirm that it would be packed in small bundles that we could load on our pickup + hitch extender combo, found that (1) it had been left outdoors all night, so all of the cardboard boxes of screws, trim pieces, etc. had disintegrated; and (2) they would not put it on the truck because it was all packed together (like, with boards all screwed down tight everywhere). They had no trailers to rent (and weren’t going to give us a deal anyways); they don’t deliver on weekends (we would have had delivery if they had told us that this wouldn’t work – which the guy working on Saturday seemed to immediately know, but apparently no one else did). None of the rental places had any trailers long enough. So after many phone calls, we finally found one U-Haul place that would rent us their only truck that was long enough – their leaky 26′ (26 foot!!!) one. Fine, we got the truck. It ended up costing about $100 and some additional aggravation – they nickel & dimed the gas so we had to go back out and put in $3 of gas at the end of the day, after unloading about 40 soaking wet pieces of heavy metal from the truck and up 2 flights of stairs to the house. Six hours later — instead of the 2 hours we expected it to take to get metal to the house — we called it a day. When the “must be stored properly” label looks like this, it’s a bit ironic. Today was a fresh start. 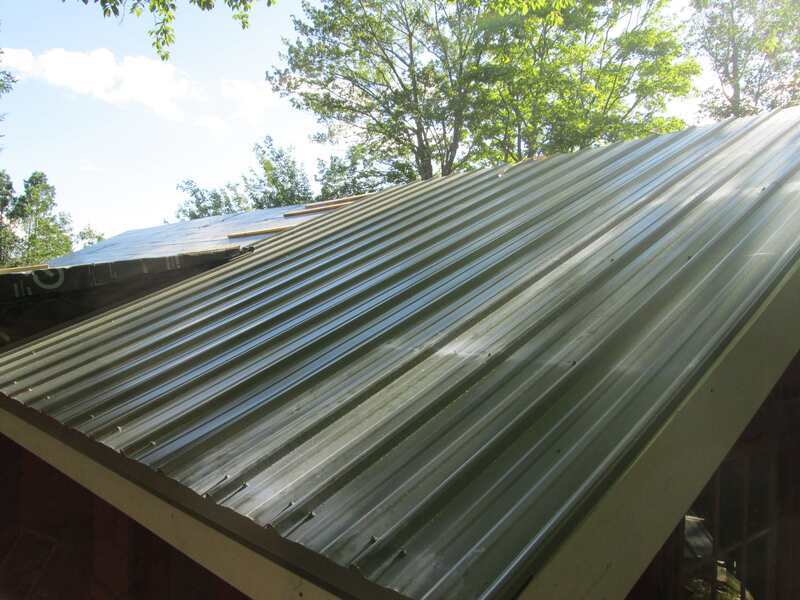 Albeit slow – we’ve never installed a metal roof before, so had to constantly refer to the manual. We got four sheets on, about 1/6 of the roof, after finagling with fascia and making decisions about squareness and how to mark for screw lines and all that jazz that takes a while to figure out. We will get this stuff on by the end of the week. Solid start, finally. 4,660 pounds of shingles taken to the dump. We took the last load before sneaking out of town for a brief (but fun!) vacation with S’s folks. We needed to recuperate for a couple of days! It was almost 2-1/2 tons, after all. Which translated to about $250 of dump fees and untold toll on our olfactory systems. (That signature fishy, garbagey, poopy landfill smell is quite lovely during the hot summer). Ghetto outside, but the inside is looking tight! It’s been a big couple of weeks. We’ve gotten the whole roof torn off (4 layers of shingles, lots of miscellaneous roofing, too many nails & tar – we are up to 3,820 pounds of shingles brought to the dump and the final load is in the truck right now, waiting for the dump to open in the morning). With help from a friend, we got a new beam placed inside, and new rafters sistered to the old, mostly good but not up to spec ones. All this work has made the place look really ghetto – we have had to cover everything with tarps as we wait for the roofing; we also got a carport thingy (used) and haven’t finished it yet, so more tarps. And there’s been just trash everywhere as we steadily get everything to the dump. Ugh. We are getting there, neighbors! We promise. Soon: no tarps! Second half of the roof: deshingled! Not much rot on this side – in fact, none. Just had to patch an old vent hole. Even over the porch, it’s in great shape. And the last shingle pile. Total weight to be determined tomorrow. But the inside is clean! K cleaned it up while I made a dump run. Die ants, die! Diatomaceous earth perimeter around the new lumber. A new beam! What was there before was best described as a pile of garbage (rotten, wrong sized lumber all cracked and destroyed by the chimney). K and P starting to sister rafters onto our new beam! Now that’s a well-supported roof!